So here is good news. I played in that golf mens night again, and was lucky again! 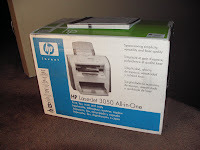 I won a printer ,scanner, copier,and Fax! And $10 ! I only shot a 84. 45 on the front 9 and 39 on the back. Also I am getting closer to finishing the land scaping on my house. All of the gravel is spread out. I hope to this weekend put a gate up. I will send pictures when I do.